Material Water, Sodium Laureth Sulfate, Cocamidopropyl Betaine, Sodium Chloride, Hydrolyzed Keratin, Polyquaternium-10, Perfume, PPG-9, Sodium Acetate, Isopropyl Alcohol, Magnesium Chloride, Magnesium Nitrate, Citric Acid, Sodium Hydroxide, Disodium EDTA, DMDM Hydantoin, Sodium Benzoate, Methylchloroisothiazolinone, Methylisothiazolinone, Potassium Sorbate, Phenoxyethanol, Benzyl Alcohol, Butylphenyl Methylpropional, Citronellol, Geraniol, Hexyl Cinnamal, Limonene, Linalool. Feature Want to control unmanageable locks? Looking for the perfect product to smooth and tame your frizz? Step up TRESemmé Keratin Smooth. TRESemmé Keratin Smooth brings frizz calming innovation to the fore to give you up to 48 hours of frizz control. Infused with Keratin for hair that’s silky smooth but still full of natural movement. 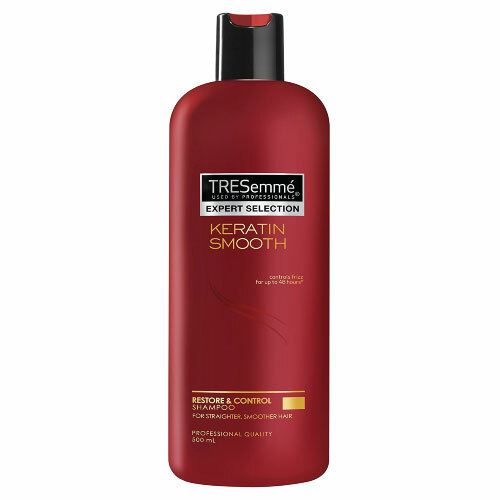 TRESemmé Keratin Smooth Shampoo is formulated to leave your hair gorgeously sleek and frizz-free for up to 48 hours.